Only 500 meters to the ocean! Close to the beach with stunning ocean views, great surf and endless sunshine. Pure Surf Camp Morocco is the ideal winter surf destination! Pure Surf Camp mediates surf trips to the newly built and nicest camp in Morocco. The day to day running of the camp is undertaken by Deep Curl SARL who work closely with Pure Surf Camps to provide guests with a perfect surf holiday to Morocco. The team have also recently opened a Beach club where you can relax before, after, or between surf sessions. At the beach club you have free access to lounge area that normally costs 7 €, as well as to the showers, bathrooms, bar and restaurant. The house is located extremely close to the beach and easily meets every requirement we look for in a surf camp. The rooms are new, perfectly furnished and retain some Moroccan flair in their design and decoration. The ability to watch the sun dip behind the Atlantic from the rooftop terrace with the other guests, or even from your room with your partner, adds a quality to this camp that makes it impossible to beat. If you look straight towards the ocean from the rooftop terrace you will see the local left-hand beach break called K-11, and then 5 minutes’ walk along the bay you’ll be at a right-hand point break, meaning even within walking distance you have a great selection of places to surf. When staying at Pure Surf Camp Morocco you also have access to an infinity pool that is 2 minutes’ walk away to cool off on warm afternoons and continue to watch the waves break out front. This part of Morocco averages 330 days of sunshine a year, so the chances of being able to make the most of all these outdoor features is extremely high. Pure Surf Camp Morocco provides the highest quality accommodation, epic surf, unbeatable surroundings and a friendly and relaxed atmosphere for your next surf trip. Check out the camp & its surroundings! The surf camp is in a town called Aourir, which, together with the neighbouring town of Tamraght combines to make what is known as Banana Village. Taghazout is less than 5 minutes away and is a little bigger and is essentially the centre of surf culture in Morocco. This area is less frequented by travellers than bigger cities like Marrakesh or Casablanca, which means you still get an authentic Moroccan experience, especially when visiting things like the weekly market. Another great trip from here is to go to Paradise Valley which is a natural oasis made up of streams, small lakes and waterfalls at the edge of the Atlas Mountain Range. Every Wednesday going to the Aourir market is well worth a few hours of your time. The thing that makes this market special is it hasn’t been corrupted by an explosion of tourists visiting it like the markets in larger cities. It’s about 100 meters away from the camp and some of things you can find there you will not find anywhere else in the world, like local fresh & dried fruit, oriental spices & herbs, Moroccan grown nuts and plenty of other delicacies. The market is surrounded by stalls that sell local food, coffee and the famous mint tea. La Source is an unreal bay that’s hidden by steep cliffs along the coast. A small hotel has popped up at the cliff above the beach which has hidden it even more. To access it you duck through the hotel and follow the stairs that weave down the cliff to find the secluded bay. Half Austrian, half Moroccan, Richi is the perfect contact partner. He has travelled, and worked all over the globe and taken what he’s seen and learnt into making this the best surf camp in Morocco. He is a poster child for Moroccan hospitality and friendliness and will do everything to make your, and surf trips memorable for all the right reasons. Tino is Richis’ right-hand-man. He can help you out with anything you need from the time you book, till the time you are on the flight home. He's worked at various Pure Surf Camps around the world, and is still as stoked on surfing as the day he started. He is a great surfer and knows the spots around camp like the back of his hand. You’ll always be greeted with a massive smile when you meet the lovely kitchen staff at Pure Surf Camp Morocco. They are not only super friendly, but can cook up amazing local, and international cuisine. Even if you can’t speak French or Arabic, communicating is no problem with a mix of English and various hand gestures, plus of course a massive smile, anything is possible. The team not only provide you with amazing home cooked meals, but also make sure the accommodation is looking tip-top throughout your stay. The dorm rooms have been freshly built to provide another accommodation option to visitors. The team decided on moving away from bunk beds and only using large single beds in the dorm rooms. This means more space for everybody, better night’s sleep, and a more enjoyable surf trip. The rooms either come with 3 or 4 single beds and are perfect for travelling groups or individuals going on a surf trip to Morocco. The 3-person room faces the ocean, meaning you get to wake up to a view of the surf. The 4-person room doesn’t have an ocean view, but you still have the rooftop terrace with 180° ocean view only a few steps away. These rooms have been freshly re-built and renovated. There are 6 double rooms in total, 3 of which have an ocean view from bed. The rooms are spacious, light and comfortable and are the perfect place for couples or travelling friends to retreat to and recharge for the next day’s activities. All the furniture in the rooms is new from the wardrobe, to the beds and mattresses. The adjoining bathrooms have also been renovated and are modern and functional with features like rain showers and free-standing wash basins. All these bathrooms still retain that Moroccan flair that gives this place an individual identity and inviting atmosphere. Even the floor has been freshly laid throughout the building. All fresh linen and towels are included in all the rooms. The friendly team at Pure Surf Camp Morocco will get you up and riding your first waves quickly, or, if you’re already more advanced, push your surfing to the next level, all while having a great time under the Moroccan sun. Morocco has the wave that everybody imagines in their mind. Whether it’s a big long right-hander to learn turns on, or mellow beach breaks to learn how to get up, the team will get you to the right wave. K-11, the local spot, is perfect for learning, and 5 minutes away on foot you have the first of many long point breaks. The coaches are also what makes learning to surf in Morocco so special. The team are super friendly, funny, experienced and internationally qualified through the ISA (International Surfing Association). They give 2 surf lessons a day of about 2 hours each meaning you get plenty of time to improve quickly. The course runs for 5 consecutive days, and your board and wetsuit are yours for that time, so if you want to surf even more you can. Manu was born in Munich, developing a love for surfing in the Eisbach. He started working for Pure Surf Camps a few years ago and has advanced to becoming the head coach in Morocco, during the off season he also completed a bachelor in sport science. He’s a great surfer, and amazing coach that will have you improving quickly while having a lot of fun. Armin was there almost at the beginning when the surf camp first popped up in Morocco. He’ll be in the water with you, giving you pointers, telling you what waves to paddle for and where to sit, or telling some jokes. He’s a local of the Moroccan coast but gives his classes in English. If you want to surf the best spots around camp like Anchor Point, yet still want some advice before you hit the water about the waves and your surfing; this is the option for you. Pure Surf Camp Morocco is heaven for experienced surfers. With breaks like K-11, K-12, Banana Point and Devil’s Rock located within walking distance from the camp. And spots like Boilers, Anchor Point, Hash Point, La Source, Killers and Taghazout only a few minutes away by car. The guides will bring you to the best spots and your surfing is bound to progress quickly. Morocco is famous for long, right-hand point breaks which give you lots of time to think about what turns you want to do when you’re flying down the line, with section, upon section in front of you. Two times a day the team will find the best waves for you, regardless if it’s a short walk away or a little trip in the surf-mobil, and go out with you for about 2 hours at a time. The guides will take you out at the local spot, K-11, and check you’re up for the surf guiding, if not, an advanced surf course is recommended. If you want to go surf by yourself, or take part in the surf guiding but didn’t bring a board and wetsuit, the team at Pure Surf Morocco have got you covered. The crew have got Shortboards, Mini-Mals and Longboards as well as a big selection of ST Comp Quiksilver boards starting from 6”2 and going up. There is nothing quite like your own board under your feet but Pure Surf Camp Morocco will get you a board that comes a close second. Breakfast & lunch packet are included. To start every day the best way possible you will be greeted on the roof top terrace with not only with a majestic view and Moroccan sunshine, but also an amazing breakfast buffet and the smell of freshly brewed coffee. To give you the energy to get through your 4 hours of surfing a day the team prepare a healthy, nutritious, and delicious meal for you every morning that includes freshly baked bread, muesli, fresh fruit and vegetables bought daily form the markets, salami, ham, cheese, olives and freshly brewed coffee or tea. It’s also important to be hydrated out in the water so there’s always plenty of water and juice in the morning as well. Another great part of breakfast is you can make yourself a snack for in-between surf sessions that you can eat down on the beach to get a little energy between surfs. Daily afternoon snack when you get back from your surf is included. Every day when you return from your two surf sessions the team will welcome you back with a delicious afternoon snack that is included with your stay. This afternoon meal usually consists of something like freshly made soup, snacks like olives and artichokes, and bread, that is served on the rooftop terrace of our partner camp next door. Dinner also takes place on the roof top terrace, so while you eat an amazing meal you can watch the sunset and enjoy a glass of wine or a cold beer. The team goes to the market to buy the freshest seasonal ingredients to prepare the meals, meaning the meals are fresh, healthy and delicious. The buffets include both authentic Moroccan food and western dishes and can include things like fish, meat, chick peas, home-made bread, a huge selection of salad and pasta. Once a week the crew fires up the BBQ for an evening around the grill. Every day there’s always plenty of vegetarian and vegan options available. 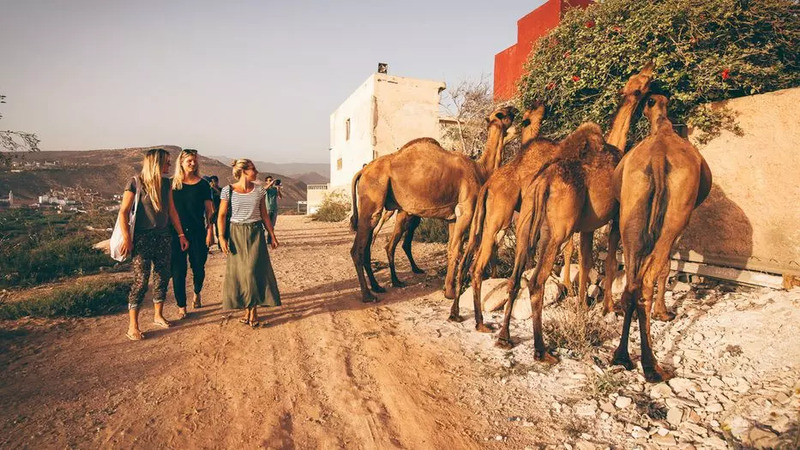 The team at Pure Surf Camp Morocco will spoil you with amazing food day in, day out, which will make this an amazing holiday from start to finish. Work-out, stretch and clear your mind all under the Moroccan sun with the onsite yoga classes. Yoga will improve your flexibility, tone muscles and improve balance which will all ultimately improve your surfing. The classes also take place on the roof with a stunning view, sunshine, and fresh ocean air, all of which makes the experience all the more enjoyable. The classes happen 5 times a week, 2 times a day, with each class taking roughly an hour. If you take part in the Yoga Package you will be able to join all 10 classes, plus join on the trip to Paradise Valley. Lisa is a friendly and likeable yoga teacher as well as a qualified physiotherapist. She’s worked at various Pure Surf Camps and has a ton of experience. She finished her physiotherapy degree in 2011 where her courses focused on things like detecting and treating spine and back problems, foot Reflexology and Osteopathy. Three years ago she finished her Yoga teacher course and now takes Vinyasa classes at camp to get you limber and fit before or after your daily surf sessions. Definitely don’t miss the chance to go to Paradise Valley, this oasis on the edge of the Atlas Mountain Range is a water wonder world. There are lakes, streams waterfalls surrounded by amazing rock formations and palm trees. The team can show you the best spots to jump in from, places to slide down, or caves to swim through. The trip only takes place if there is plenty of water in the canyon, otherwise it’s not so much of an oasis. Individual price 20 €, and included in the yoga package. Once a week, 3 minutes away from camp, there is a huge authentic Moroccan market. This is the place to experience the real culture of the country and explore the amazing smells and tastes of the herbs & spices, tea, fresh fruit and vegetables that you can find in the Orient. The market here hasn’t been influenced by the influx of tourism like the markets in Marrakesh and Agadir so the experience is much more original. Every week when the market takes place a group form the camp and head down to check it out. 1 week with full-board. Arrival and Departure possible any day of the week. We recommend booking either a Surf Course, where equipment rental and transfers to the beach are included, or the Surf Guiding where just the transfers are included. On arrival a Tourist Tax of 10 € must be payed by every guest. Prices for extra nights when stays aren't exactly 1 or 2 weeks long. * The Paradise Valley trip only takes place if there is plenty of water in the canyon. We offer an extra service where we will find you the cheapest available flight, then contact you with the final offer. Flights to Agadir are much easier and most airlines fly there directly. When the flights are booked we can organise an airport transfer to come and meet you at the airport, and take you to Pure Surf Camp Morocco. Pick up & Drop off at Agadir Airport costs 30€ per Person. Just send your flight details to the team once the flights are booked. You’ll find their email address on the invoice from Pure Surf Camps. CTM drives from Marrakesh to Agadir multiple times a day. The trip costs around 10 €, plus 1-2€ for luggage, depending on how big it is and if you have boards with you. The buses are comfortable and have air-conditioning. The bus stop is close to the central Marrakesh Train Station, on Rue Abou Baker Seddik. Another option is Supra Tours. At Agadir Airport, you can easily get a taxi that will take you straight to Pure Surf Camp Morocco. The drive takes about 40 minutes and costs between 300 and 400 DH (around 30€) The price varies depending on if you have a surfboard or not, how many passengers there are, and how much luggage you have with you. Make sure you set the price before you set off, and if you’re travelling alone try and find someone to share a taxi with to split the bill. From Agadir Airport drive towards Aourir, otherwise known as Banana Village. Take the exit called Anza and follow the two-lane expressway for 2 minutes. You’ll pass a palace on the left-hand side next to the sea, and then you take a right down a small gravel road. Stick to the left-hand side and follow it for around 150 meters and there you will find Pure Surf Camp Morocco. If you end up driving up a hill and entering a town, that means you are in Aourir, and you’ve gone a little bit too far. Just turn around and drive back along the coast until you see the palace and take the small road, that’s now on your left.